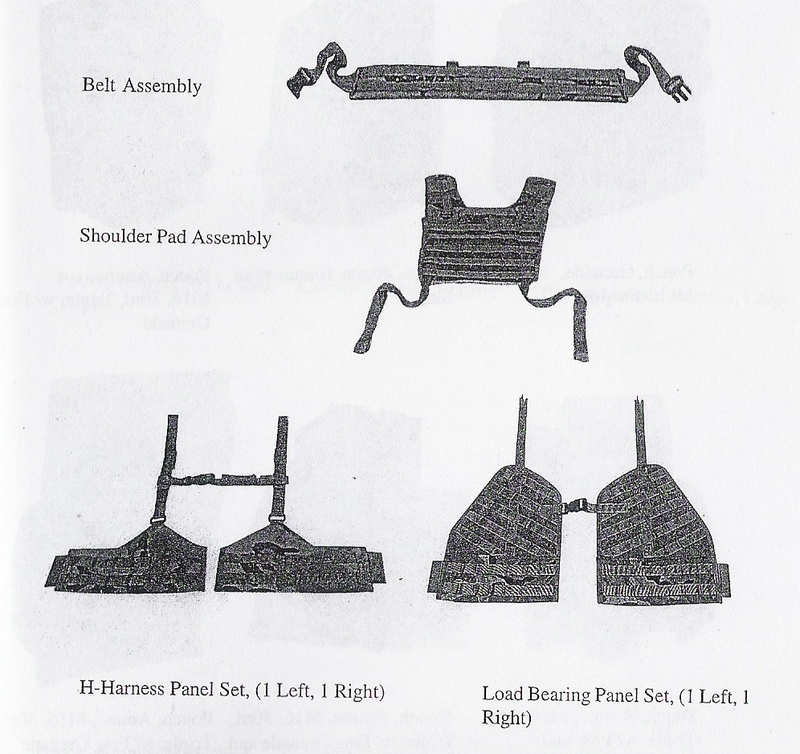 The SPEAR Equipment Load Carrying System (ELCS) is a modular pocketing and harness system allows mission tailoring of load and system configuration. The ELCS is compatible with the SPEAR Body Armor and Backpack Subsystem, and provides optimum compatibility with individual equipment and weapons. ELCS is divided into two basic categories of components, as follows. Platform Components, which pouches and accessories attach to, or which support the items which accept pouches. Pouches/Accessories, which are designed to attach to platform components and carry a specific item or items. The design of the ELCS is such to allow mission tailoring of not only the equipment to be carried but also the platform on which it is carries. This is accomplished by providing maximum modularity in both the pouch attachment method, and also the variety of available configurations of the platform components. 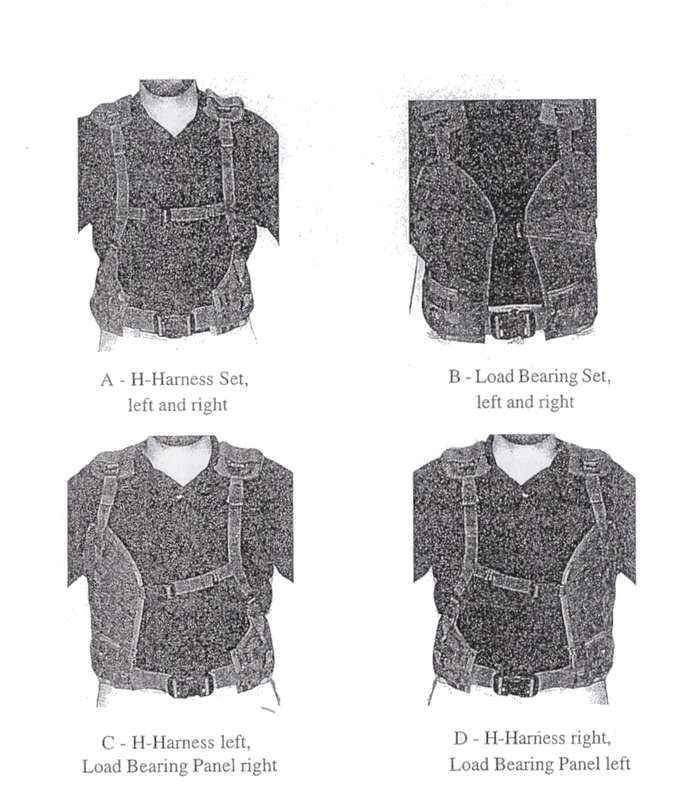 The platform components allow the system to be configured in a traditional harness system, with equipment being carried on the belt (using H-Harness Assembly), or configured in the style of load bearing vest (using Panel Set), or in a combination ot the two. In basic terms the platform components may be configured in four ways dependant upon the mission requirements and user's preferences. The platform components feature easy adjustments at the shoulder (height), waist (girth) and chest (girth) and are a single size system. The individual pouch and accessory components are attached to the platform components utilizing the Pouch Attachment Ladder System (PALS). This system attaches items through the "inter-weaving" of webbing between the item to be attached and the platform to which it is being attached. This provides a strong, stable attachment system to ensure the attached item remains securely in place. Provision has also been made which the system to allow further customizing providing ALICE Adaptor components. These items act as an interface piece allowing items with ALICE attachment or select commercial attachment systems to be securely carried on the ELCS. Belt with Buckle 1 ea. Triple 30rd M4 Ammo Pouch with Frag & Multi-Purpose Grenade Pockets, Right 1 ea. Triple 30rd M4 Ammo Pouch with Frag & Multi-Purpose Grenade Pockets, Left 1 ea. 1qt Canteen Cover 2 ea. General Purpose Pouch 2 ea. Double 30rd M4 Ammo Pouch 3 ea. Single 30rd M4 Ammo Pouch 3 ea. 100rd SAW Ammo Pouch 2 ea. First Aid/Compass Pouch 2 ea. 2qt Canteen Cover 2 ea. Storge Organization Device 1 ea. Single 40mm Illumination Round Pouch 4 ea. Single 40mm High Explosive Round Pouch 4 ea. Double 40mm High Explosive Round Pouch 2 ea. Quad 40mm High Explosive Round Pouch 4 ea. Triple 20rd M14 Ammo Pouch 2 ea. Triple 30rd MP5 Ammo Pouch 2 ea.